I’m a fan of the one pan baked recipes. How about you? They are super easy for weeknight meals and usually can be done within 1 1/4 hours. 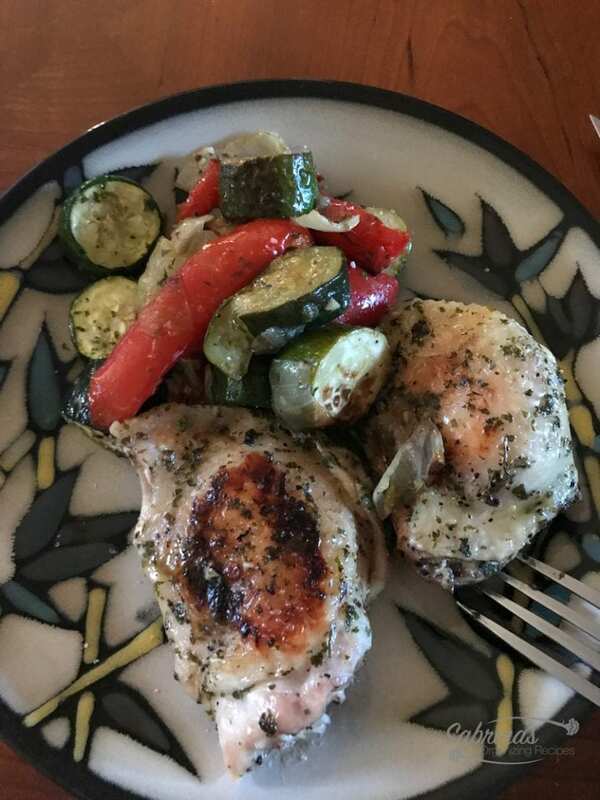 This recipe is keto friendly and is great for a family of four. 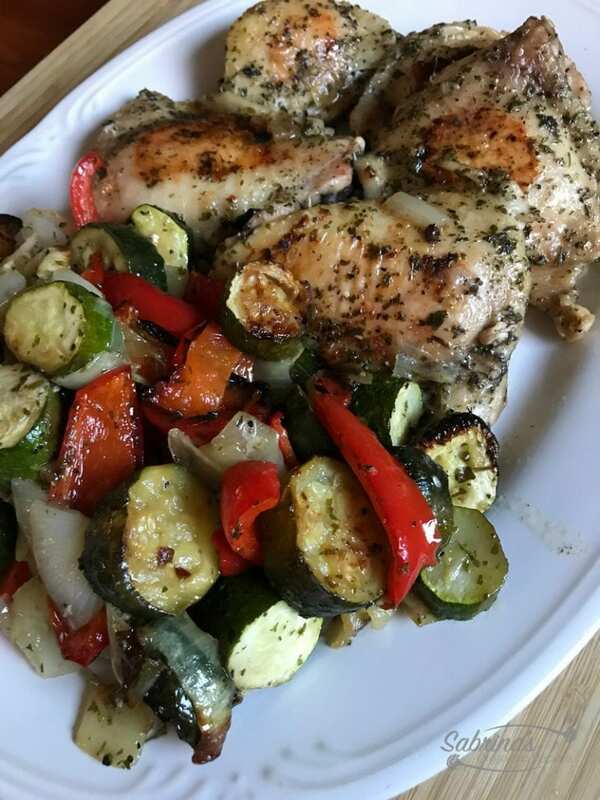 If you want to visit our other keto diet recipes, feel free to click here. Below you will notice that I simply added parsley, garlic, oil, and salt/pepper. That’s it. The parsley brings out a nice simple flavor to the meat and veggies. When picking your herbs, pick something that doesn’t add too much of its own flavor. You want to add to the flavor of the chicken and the veggies not take away from them. Cut all the veggies as indicated above then put in a bowl to the season. Take one 1 tbsp of dried parsley. Hold the parsley in your hand then crush the parsley while adding to the veggies. This helps the parsley coat the veggies more evenly. Add 1 tbsp of avocado oil and 2 minced garlic to the veggies. Then add salt and pepper to the veggies. Set aside. Place the chicken thighs in a bowl to be seasoned. Add 2 tbsp of avocado oil. Add 1 tbsp of dried parsley. In your hand crush the parsley, as you did with the veggies. This makes the parsley finer and easy to mix well with the chicken. Add salt and pepper to chicken thigh. Cover the cookie sheet with parchment paper for easy cleaning. Then, add the seasoned veggies to the sheet. Then nestle the chicken thighs (skin side up) in the veggies. Make sure the veggies are touching the parchment paper to get browner skin. Place in the oven for 20 minutes then pull it out and turn chicken and veggies over for another 20 minutes. Take out and cover with foil for 5-10 minutes to cool down. Transfer to a serving platter for serving and enjoy. Feel free to add olive oil or MCT oil for extra fat before eating. I hope you try this recipe. If you wish to print the meal, please see below. So, what do you think? Doesn’t it look yummy? I definitely will be making this meal again for those busy weeknights. Would you make this dish for your family? Please leave a comment below. Looking for some other chicken thigh recipes? Check out these I found. These look and sound delicious – will definitely be trying.